Now, we can register our Citycell number in Twitter and upload a message to share with our Twitter friends through all types of Citycell Handset model by SMS. 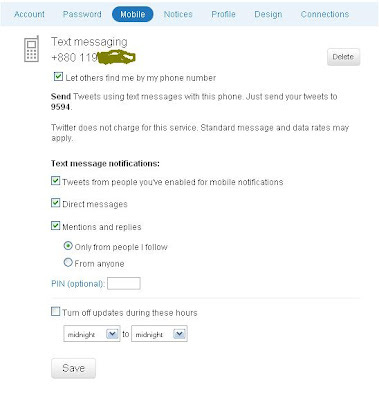 To register you Citycell number in you Twitter ID, follow the below statements of sending SMS from your handset. First SMS] Send SMS from your Citycell Handset, by writing start and send to 9594. Now reply the SMS, you received, by writing your Twitter ID example sroyit and send to 9594. Now reply the SMS, you received, by writing your Twitter Password and send to 9594. Forth SMS] you will receive a SMS as Your password is correct! Reply w/ OK to confirm you want to use Twitter with this phone. After receiving the SMS, reply by writing Ok and send to 9594. Fifth SMS] you will receive a SMS as You're all set up to use Twitter with this phone and we've sent your Tweet. Reply w/ TIPS to see what you can do with Twitter. Now write a SMS as TIPS and send to 9594. Now, write any SMS and send to 9594, which will be displayed on Twitter wall. Example, write SMS as "First time send message to Twitter from Mobile" and send to 9594. Show your Tweet as a reply directed at another person, and causes your twitter to save in their "replies" tab. Example: @samiul_86 I love that song too! Send a person a private message that goes to their device, and saves in their web archive. Example: D samiul_86 I love that song too! Example: M samiul_86 I love that song too! Send another user's latest Tweet to your followers. 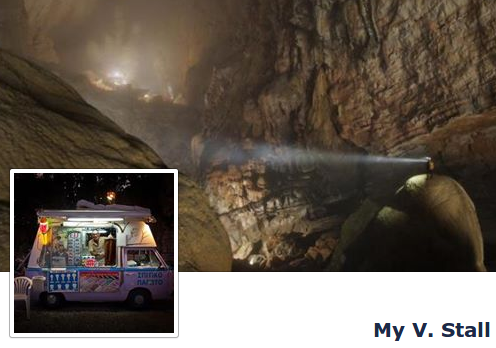 Update the location field in your profile. 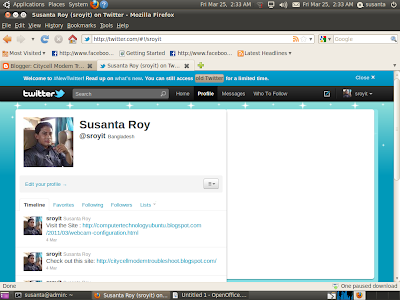 Retrieve the profile information for any public user on Twitter. 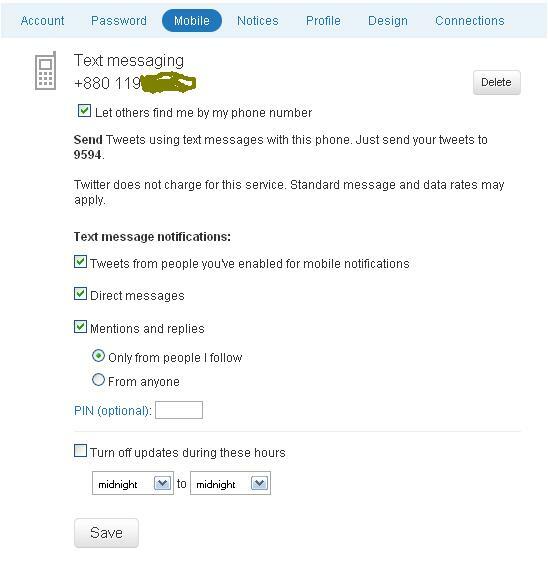 Retrieve the latest Twitter update posted by the person. You can also use G ‘username’ to get a user's latest Tweet. Send Text ‘help’, ‘info’, or ‘aide’ to Twitter will bring up helpful tips. Turn all your authorized Twitter updates and notifications on. Turn off all updates except direct messages. Send STOP again to turn off direct messages too. Turn ALL Twitter notifications off. Type: STOP or QUIT or End or Cancel or Unsubscribe and send to 9594. Turn on notifications for a specific person on your phone. Turn off notifications for a specific person on your phone. This command allows you to start following a specific user, as well as receive SMS notifications. Example: Follow jerry, or F jerry for short. This command allows you to stop receiving SMS notifications from a specific user. Example: Leave Samiul_86, or l Samiul_86 for short. 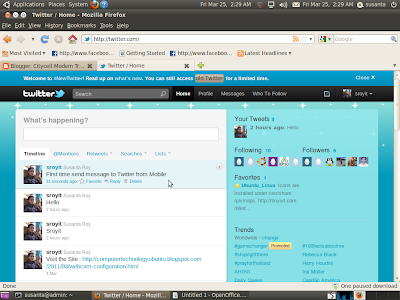 Browse the www.twitter.com and click Profile > Edit your profile> Mobile and edit the options.